Welcome to Porthleven, Cornwall. The UK Mainland's Most Southerly Working Port. An area stretching from halfway along what is now known Bay View Terrace, around past the clock tower and up Cliff Road to the junction. An area on Breageside where the lifeboat house is. 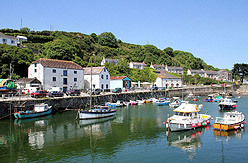 As a direct result of the wreck and one man's efforts (Tobias Roberts), Porthleven harbour came into existence, starting Porthleven on the road of development. Over the following 200 years the village gradually expanded its borders and its population currently standing at approximately 3,500. Porthleven experienced a journey through two world wars, the rise and fall of the fishing, boat building and other industry. Now it is a tourist destination known as Britain's most southerly working and historic port but remains a place of trade to over one hundred small businesses. Recognised as an area of outstanding natural beauty with the long distance coastal path passing through its centre, Porthleven attracts a number of visitors throughout the year. 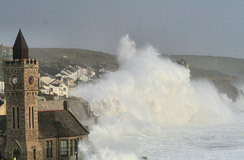 To view images of this area just click on Porthleven images to the right of this page. Accommodation comprises of Family run Bed & Breakfast, Hotels & Guest Houses, Holiday Cottages and a nearby National Trust Camp Site. The village has a variety of shops catering for daily needs as well as crafts and gifts. However the nearest petrol station is 2 miles away in the nearby town of Helston. If you are interested in dining out, Porthleven offers quality and has a reputation for fine food and dining. In addition there are three inns, fish and chips, traditional pasties, pizzas and a Chinese take-away. All the usual services and health care are available including Holistic massage should you be in need or just want to spoil yourself whilst visiting Porthleven. What is considered to be amongst the best mounted images of the area, especially storm images, can be purchased from Tesserae, located at the top of Fore Street. Orders can also be placed online by visiting www.porthlevenimages.co.uk. The photo to the left depicts Porthleven's harbour on a quiet summers evening whilst the picture below shows one of the most popular event of the year which is LIFEBOAT DAY. This is a family fun day organised by locals to raise funds for the saving of life at sea. Side shows, rides and displays are available. Find everything you need to know about Porthleven RNLI and the annual lifeboat day - If you want to support the Porthleven Branch why not make a purchase from the RNLI online shop. 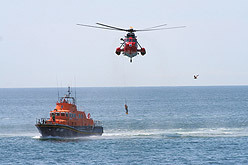 Visit the RNLI website for more information. © 1996-2017 Web Direct (UK) Ltd. c/o Porthleven, Cornwall.